It's house-cleaning time at 4shared. Next week, the July Fourth kit will be gone. If you want it, now's the time to grab it. Need to make room for more things. Did I tell you that while I was out yesterday doing errands, I managed to pick up another holiday gift? Of all the places to find it, Ace Hardware. Can't tell you what it is, because then it won't be a surprise come December. But at least I'm working on it. What a lovely dinner Moo made for us last night. Home made french fried potatoes and steaks cooked on the grill. Those steaks were absolutely yummy melty in your mouth. Later, we found out why they were so good. Somehow, the market had put chicken lablels on the packages and so the steaks were priced as chickens instead of a few dollars more a pound. Too late to do anything about it now. There wasn't even a sniff of steak left after dinner. Today I promised you the add-on to "Fairy Land." 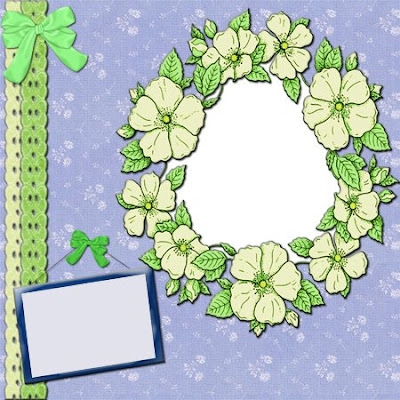 It's a set of QP's to help you get started on your layouts. Hope you like them. 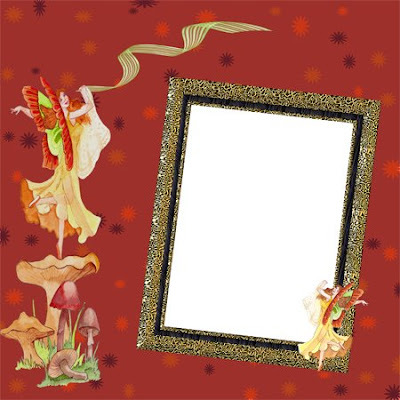 QP - 08 Set "Fairy Land"
Here is your download link for QP - 08 Set "Fairy Land"
Yeah-h-h, The TV Works Again! Last night, after I finished with my fuming and whining over the DVD and TV, I called my tech guy, Wayne. He had already been here earlier to show me how to do everything, and watched me write it all down. So do you think maybe he's annoyed with me for calling again so soon? He certainly sounded annoyed when I told him that everything was gone (not working at all). After some time and a few hmmpf's, he was finally able to talk me through at least getting the TV back on. He also told me again how to shut if off - Again, I wrote this down. THANK YOU, WAYNE. Next week, he'll try once again to show me how to do the DVD. (I hope). Tonight, I did manage to turn the TV and Cable on without any problems. Hopefully by this time next week, I'll be able to run the DVD set. Tonight, I'll the rest of "Fairy Land." This is all the elements. 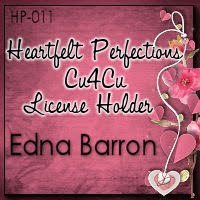 Tomorrow, I'll try to post the add-on that I made for it. Tomorrow night is a long working night, 20 hours. But I promise that if I can't post it tomorrow, I will post it by Friday. I did a bunch of errands today. Paid taxes, picked up more spring water, bought clothesline to hang my bird feeder so the squirrels can't get to it, and did my food shopping. Between that and doing the laundry, I'm pooped out. 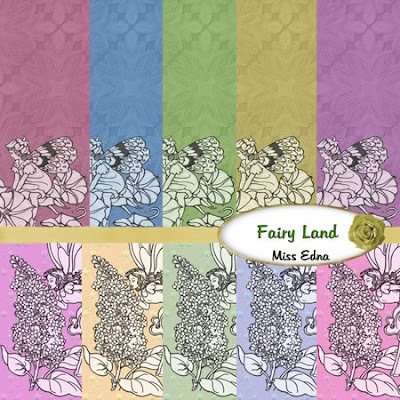 Here is your download link for Part Three "Fairy Land"
What a lovely day we had today. Warm, but tolerable. If tomorrow stays that way, we just might finally make it to the beach. I went shopping this afternoon for some more goodies so that I can make more kits. Gosh, I'm like a kid in a candy shop. "Mister could I please have two of those and one of these?" Remember the penny candy store? No? What a shame! We had this delightful little penny candy store right across from the school, and every day we would take the longest time trying to pick out the most we could get for our one or two cents. We could get a bag half full of yummy candies for 2 cents. I just took a short break to check the DVD I just taped? Everything's screwed up wicked bad, and now I'm in a horrid mood. For the life of me, I just cannot figure out how to record the programs that I save over on to a DVD. I write the instructions down, and as soon as the TV tech leaves, nothing works ever again. So now I have no TV - no nothing. There is steam coming from my nose, so I think it's time for me to go. 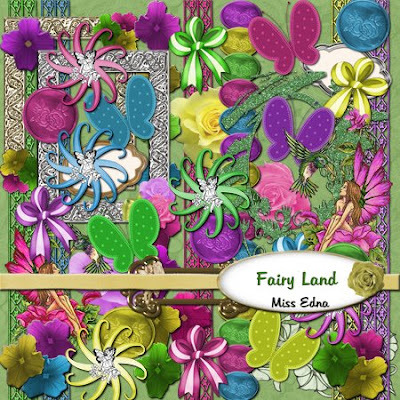 Here is your download for Part Two of "Fairy Land"
We're coming to the end of another great month. But that means that it's almost August. Can you believe that?? Seeing as how I just got caught up on my birthday and anniversary card list, I'm hoping that Christmas at least gives me some sort of warning that it's on it's way. I remember when I was little (don't snicker - I DID used to be little) and Christmas seemed to take forever and ever to get here every year. Now, it barely gives me time to plant my Spring flowers and tomatoes before it bowls me over. Must be something in my Green Tea. Tonight we start a new kit, "Fairy Land." Also, I've been working on an add-on for it. That will come after the kit. Maybe when I go to Wisconsin to visit my friend, Mary Ann, I will learn how to use my Wacom Tablet that Tootsie gave me for last Christmas. Then I'll be able to make even more nice things, I hope. It's a shame that these expensive little tech toys don't come with "Visual - How To Use" manuals for folks like me. I'll have to look around for some classes on how to use it. Enough chit chat, I'm off to play with Tootsie and watch some TV. Hope you enjoy Part One of "Fairy Land." 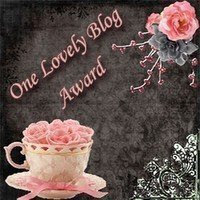 Today, I'll tell you about my new award, the "Wylde Women Award." 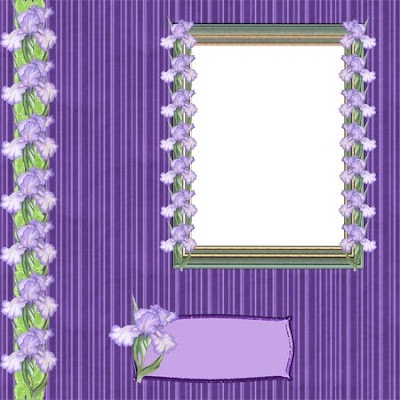 It originated with Tammy Vitale of http://www.tammyvitale.com/, and was presented to me by Shawna at: http://scrap-stuff-with-psp.blogspot.com/. Thank you, Shawna. This was such a wonderful surprise, and it put a huge smile on my face that lasted all day and night. 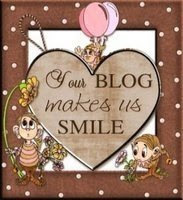 It really makes me feel good to know that my little blog brings happiness and smiles to so many people. Gosh, I'm really felling like a designer now. 1. You can give to one or a hundred - or any number in between, it's up to you. Make sure you link to their site in your post. 2. 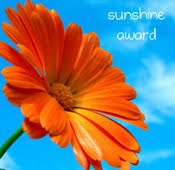 Link back to this blogsite http://tammyvitale.com/ so that Tammy can go visit all of these wonderful women, and remember the purpose of this award - To send love and acknowledgement to women who brighten your day, teach you new things, and live their lives fully with generosity and joy. There are so many wonderful blogs out there that it's hard to choose. However, I've decided to link to these wonderful ladies. These terrific women are constantly learning new techniques, and then sharing all their new creations with us. 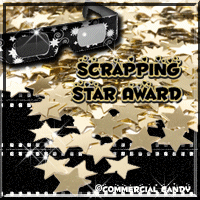 They have made scrapping so much more fun for so many of us. 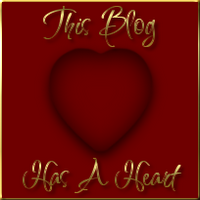 Tammy had a "thought for the day" on her blog that I liked. 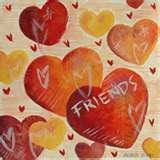 "What do we live for, if it is not to make life less difficult for each other" by George Eliot. Plus I have a new freebie QP for you. I hope you l ike it. Wowee, this is wonderful. 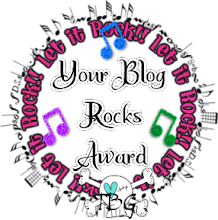 I came in to write on my blog and give you another freebie, and guess what?? I got another award. 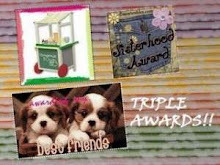 It's the Wylde Women Award, and it was presented to me by Shawna at http://scrap-stuff-with-psp.blogspot.com/. I need to think about it carefully to see who I want to give it to, so I'll be back tomorrow with that. Goodness, what a nice way to brighten up one's day. My son-in-law was by today to see what he can do to help alleviate my electrical problems. Seem I need a couple of new outlets, or something. He's such a sweetie when he wants to be. I shouldn't have said that because now his head is going to swell up bigger than a balloon. 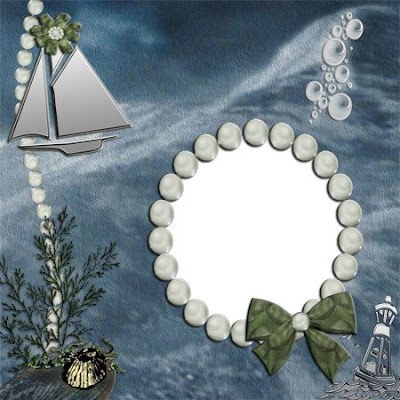 Today I made a new layout for Snow Raven's new kit, "Ocean Waves." It's in the store at Scraphead http://www.scraphead.com/ and it's on sale, too! 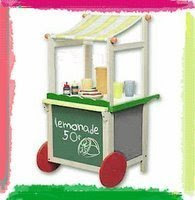 Be sure to go and take a look at all the great things that are on sale. 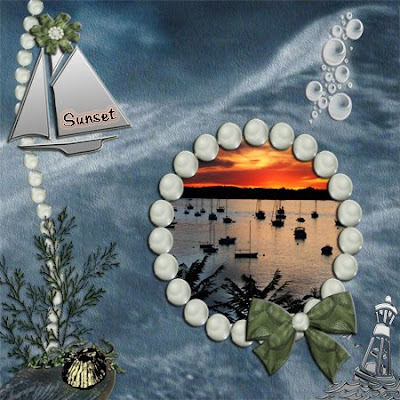 "Ocean Waves QP - 01" Kit by Snow Raven. Here is your download link for "Ocean Waves"
It's Friday again. Gosh, it comes so fast every week, I just don't know where the time goes. I must be having fun. Well actually, I am. I think I'm going to be getting Photoshop CS3 pretty soon, so that means that I can sign up for more classes and learn how to use it. I realize that most folks don't think of school as fun, but I do love learning so knowing that there will be more classes makes me one very happy little lady. Before I write on my blog every night, I read any comments that may be. Tonight I had a wonderful time reading them. It really makes me feel good to know that some folks some where are enjoying my kits. Plus I love hearing from nice folks from all over. If you have any requests, make sure to leave them in the comments section, or in the C-Box, or by e-mail. I do have one request -- a chicken kit. It may take a while, but it will come. Tonight, I'm going to post another QP for your freebie. It's one of my favorites, so I hope you like it. Now it's time for me to go play ball with Tootsie. She has this ratty old spitty tennis ball that she loves to pieces, and it's the only ball she'll play with. Enjoy your QP. Wowee, we seem to be getting all of our rain in a lump sum. This morning was a bit cloudy, then this afternoon the heavens let loose the flood gates. My rain barrel overfloweth yesterday. Today it just spilleth all over. I think I need another rain barrel. Have to keep my eye on Tootsie for a while. She did not go pee all day today from last night. Just now she made just the winkiest little puddle, but I guess it's a start. This is not a healthy sign, though. So we'll just have to watch and wait. Here is your download link for Part Four of "Summer Morning"
Today is very stormy, rain and thunder and lightening. So this will be short. 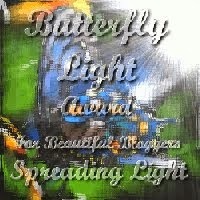 For those of you who would like to get a bug zapper like mine, here is the info you will need. Electronic Insect Swatter - Item #40122 $3.99 plus shipping. 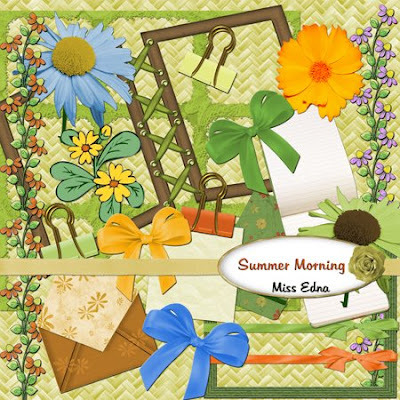 Here is your download link for Part Three of "Summer Morning." Part Two - "Summer Morning"
First I have to make a correction. 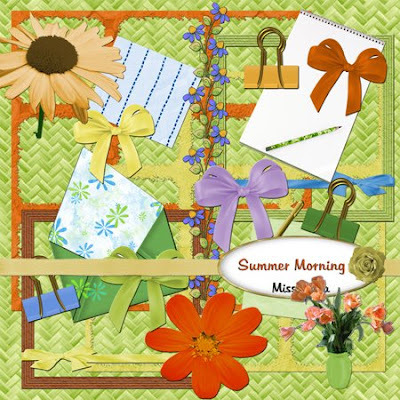 "Summer Morning" came about because of a challenge on GDS (not Scraphead, as I had earlier stated). 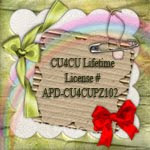 http://www.godigitalscrapbooking.com/ I seem to be getting very forgetful in my old age. Not good. 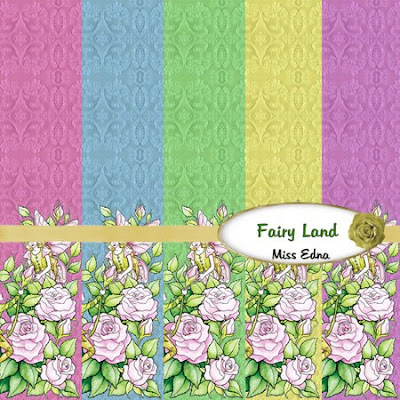 I did finally get "Fairy Land" all packaged up, so this will be the next new kit. I don't know how others do it -- design a kit, finish it, package it, zip it, and shoot if off into cyber space to a locker for you to download. I'm doing good to get all of this done in a week. Today, Uncle Moo moved my bird feeder pole a few feet away from my rose bush and paper tube. I don't know why I still call the rose bush a "rose" bush. It doesn't grow roses, just leaves and thorns. 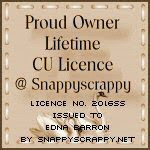 I keep it because it was a gift from my daughter, Kerri, a few years ago. We filled the birdfeeder up again, and now we'll see how much of the food actually goes to the birds. We have some neighborhood squirrels and a little chipmunk ("Chippy") who dine regularly on the birdfood, leaving very little - if any, for the birds. Today I will leave you with part Two of "Summer Morning." I hope you enjoy it. 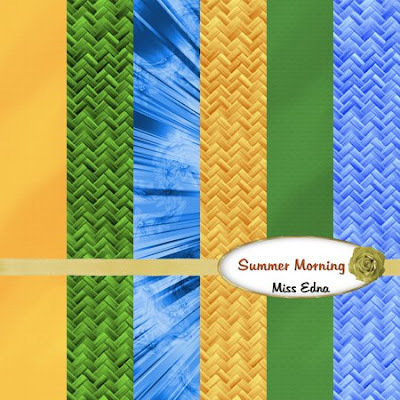 Here is your download link for Part Two of "Summer Morning." 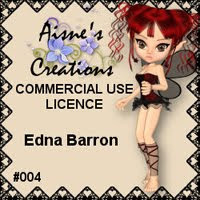 Part One - "Summer Morning"
First, let me apologise for not having the new kit "Fairy Land" ready for you. Last night, Photoshop and my laptop just would not get it all together. Every time I tried to do something in Photoshop, my laptop would freeze up. This happens every now and then. Maybe it's Adobe's way of telling me to upgrade to CS3. I would, but then they will probably have CS4 come out then. Some days, or nights, you just cannot win. But -- the good news!! I do have another new kit for you. 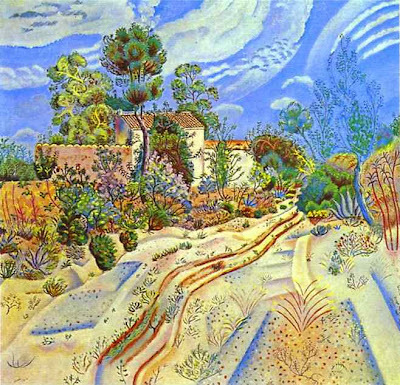 It was inspired by a painting by Joan Miro, "Waggon Tracks." We had to make a layout or a mini kit for a challenge at Scraphead, using something from this painting for our inspiration. Well, I just fell in love with the colors. I started working on a layout and making pieces, and the next thing you know, I had this big kit already done. All it needed was previews and packaging. Next, I tried to figure out a name for it, and came up with "Summer Morning." It's a good sized kit, so I had to break it up into four parts. You'll get Part One today for your freebie. I hope you like it because I think the colors in the painting are absolutely beautiful. I need to go play with Tootsie now. I was very tired this morning when I got home from work. On my way home, I stopped and did some food shopping. 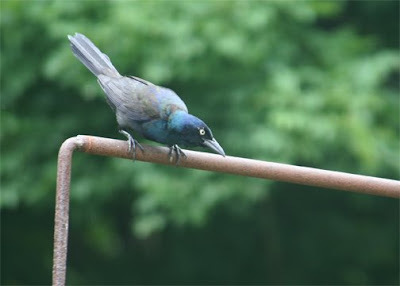 When I arrived home, I found that animals had taken the lid to the garbage can off, and strewn nasty garbage around - whatever leftovers they didn't eat. So I had to scrape and shovel this all up and re-bag it, and toss it in the trash barrel. Today was trash pickup day, as well as re-cycle pickup day. So next I helped Moo put out the trash and re-cycles to the sidewalk. Good thing too, because today the pickup trucks came early. 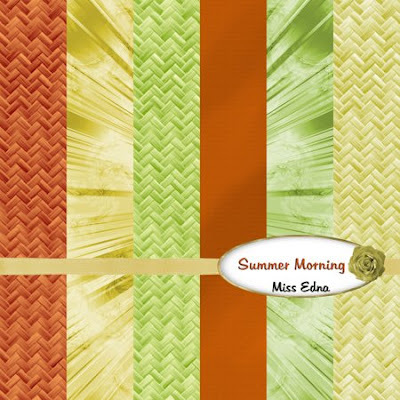 Here is your download to Part One "Summer Morning." Can't stay on too long. Outside it's very noisy with the thunder, lightening and rain. And boy, is it ever raining. It's cleaning my car, and saving the rest of my plants. I lost some of my flowers to the wicked heat. I meant to tell you about my new fly zapper. But I only got to use it today. All flies seemed to disappear the day the zappers arrived. One for me and one for Moo. 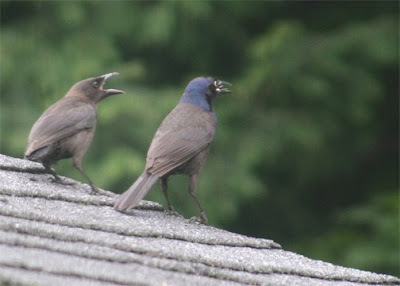 This afternoon, one brave little fly came near me while I was looking out my windows at the birds. I quietly picked up my electric fly zapper (looks like a little tennis racket) and WHAP! I zapped the little bugger. Actually saw him turn to toast on the net part of the zapper. This is such a fun little machine. Tonight, I'll try to finish up "Fairy Land." Meanwhile, I have a QP for you. Hope you like it. Another sweltering day out there, but you know what? I'm glad to be able to feel it -- it means I'm still here. Of course, I'll still use the fan to keep cool. The next kit is just about ready for packaging. I finally gave it a name - "Fairy Land." I like fantasy themes, so maybe I'll try for a couple more in this line, dragons, wizards, witches, etc. If you have any suggestions, please let me know, and I'll do my best. Meanwhile, Moo had a pretty good day yesterday. For his birthday, I gave him two tickets to the Music Circus. This way, he could take a friend. Oh, yes, and a fried clam dinner. He didn't want scallops, I had those. Lordy, I do love fried scallops. Today is Moo's big day. His birthday and my husband's was the same, so every year I would buy four lobsters and make a nice lobster dinner just for the two of them. Michael's not here this year, so I thought I would do something different. I'll pick up some fried scallop dinners for us. Oh yummy! Now my mouth is watering for the fried scallops. I'm almost finished with the next new kit. I just have to figure out what to name it. Then, of course, it needs to be packaged up. Hopefully it will be ready for next week. 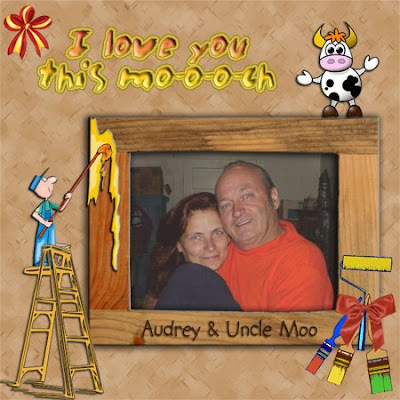 Tonight, I have a layout to share that I made with the "Painter Moo" kit. This is for you, MOO. HAPPY BIRTHDAY TO YOU. WE LOVE YOU. 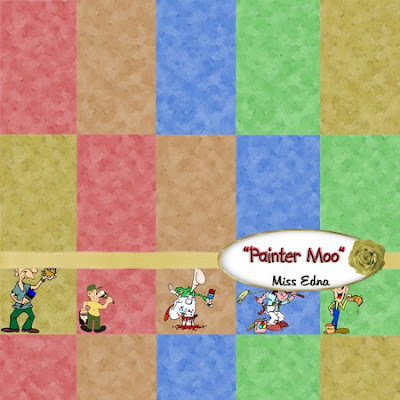 Here is your download link for "Painter Moo QP"
Last Part of "Painter Moo"
Today is our friend Joe's birthday. HAPPY BIRTHDAY JOE!! At our age, it's actually quite nice to see another birthday roll around while we're still able to enjoy it. Tomorrow is Moo's birthday. Interesting that best friends should have birthdays a day apart. It makes celebrating a lot more fun sometimes. We're in the middle of a heat wave - high 80's to mid 90's with lots of humidity. 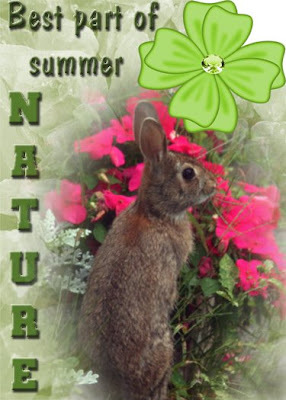 We need rain to cool things down and to water our plants and lawns. Getting in my car is like going into a sauna. If I could ride around with just a bath towel on, I could probably learn to enjoy the heat. 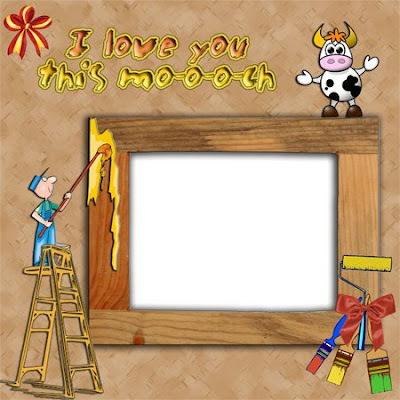 Today,I'll post the last part of "Painter Moo" for you. This will be the elements. Also, I have a couple of birdie pictures to share. That's all for today. Got to get ready for work shortly. Enjoy the rest of the kit. Tonight will be a quickee post. My very favorite TV show starts it's new season tonight in a few minutes, and I tend to get just a tad ugly if I have to miss it. In case you're wondering, it's "Project Runway." 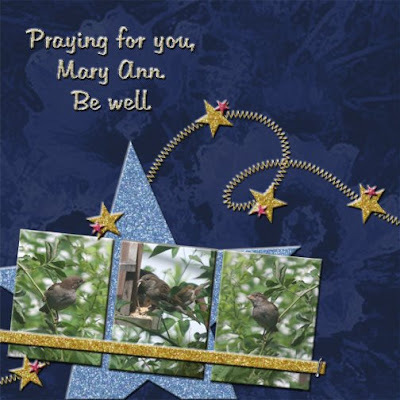 First I want to let my friend Mary Ann know that I'm keeping her in my prayers. She's having more tests tomorrow, and maybe even more surgery in addition to the surgery already scheduled for August. 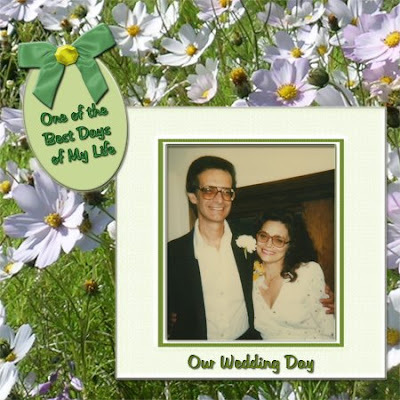 I've made her this card, but note the beautiful background. it's made from one of Mary Ann's own photographs. 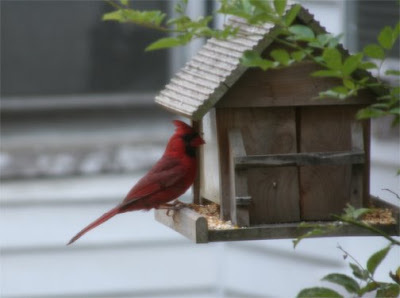 This morning when I looked out my window, there was a beautiful red Cardinal on the birdfeeder. Shortly thereafter, came a Blue Jay. I tell you folks, I do love my new windows. Here's a photo of the Cardinal. 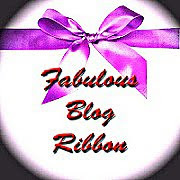 Blogger seems to have made some new changes with the way things are placed on the blog when you type or add pictures. So bear with me while I try to figure it all out. Most of today, I spent trying to finish up a new kit. Do you know that it takes hours just to make the previews for the new kits? And when you're finished, you have to zip it all up and post it out into cyber space, create a folder for it and acquire the download links for the various parts. That's the better part of a day right there. It's possible that I'm just slower than the average scrapper. My friend, Kyra, designs a whjole kit, and does all this extra work to finish the kit -- every single day!!! My hat is off to her! This is a week to celebrate. Uncle Moo has a birthday this Friday. Another year that I'm very grateful to have with him. So today, you get Part One of "Painter Moo." 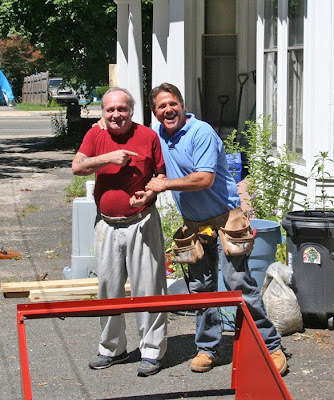 Do any of you have brothers, hubbies, friends who are painters by trade? This is a fun kit for scrapping them. 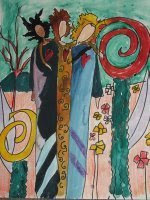 There are three paper parts, each one featuring a different character, plus the elements. Want to see the preview? I'll have to do a "Tootsie" kit, too. This kid keeps us going day and night. She's always doing something comical to brighten up a dull day. This morning, she greeted me with hugs and kisses, and ran around all excited that I was home. She had her morning piddle and got her Greenie treat. (These are her very favorites) Then she went to look for her ball to play, while I went to turn on the computer. Our pets are very intelligent and love unconditionally. Maybe this is why we need their companionship. What a dull life this would be without them. I'm off to watch some TV with Tootsie. Enjoy Part One of "Painter Moo." 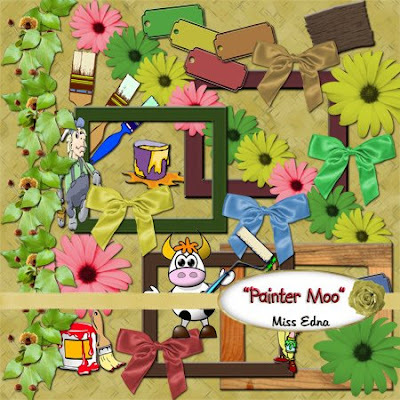 Here is your download link for Part One of "Painter Moo." I have a new kit for you this week. It has four parts, and I'll start posting it tomorrow. First, I have to get it all zipped up and out to 4share. 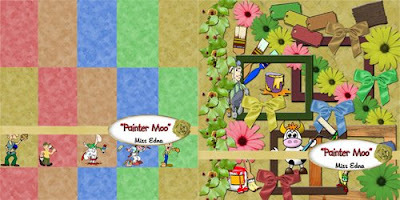 The new kit "Painter Moo" is a celebration of Moo's upcoming birthday. Have you guessed yet? Yup, yup, he's a painter. For today, I have a couple of layouts to share that I made for challenges. The first was made for the template challenge at GDS. 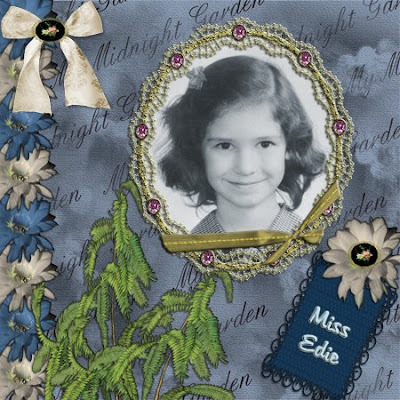 http://godigitalscrapbooking.com/ The template was supplied by Andrea Gold, and the kit used was the GDS June Collab Kit. The pictures show off my beautiful new bulkhead. 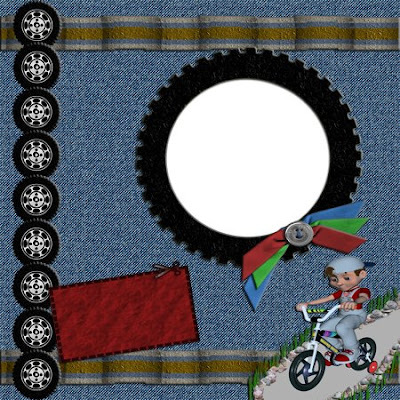 The next layout was made for a challenge at Scraphead, and it's theme was to be the best day of one's life. I had many best days, but this was one very big one. It's good to have memories. My, my, we were so young and happy. We each had our own business, and of course, children. Well, now the businesses are done and over, and the children have all grown up. Most have married and had children of their own, some even grandchildren. Time sure flies when you're having fun. 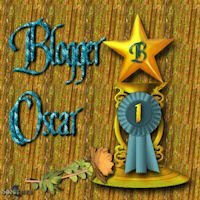 First let's put up my list of nominees for the Brillante Weblog Award. 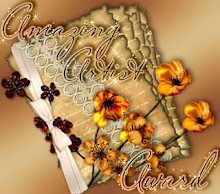 I had to do some soul-searching because there are so many wonderful scrap blogs. The first name on my list is, of course, Snow Raven. Without her, I would not be here at all. She gave me my chance to show my work, and helped me to grow as a designer. 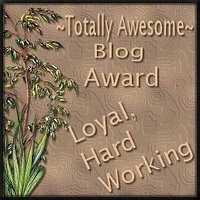 My award came from Kyra -- http://smiekeltje.blogspot.com/ I am in awe of this wonderful lady's talent. She is an inspiration for me to try to do more. 1. 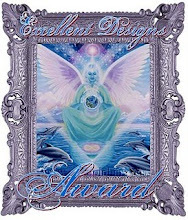 The winner can put the logo on her/his blog. 5. 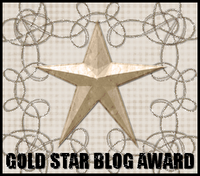 Leave a message on the blogs of the persons you've nominated. 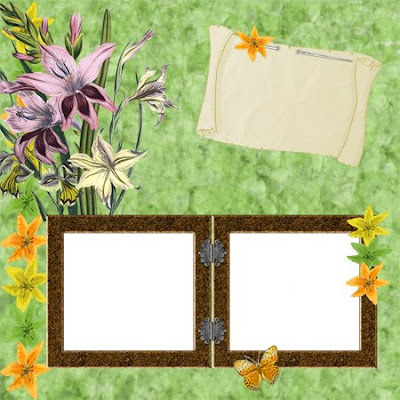 Today I have a layout to share that I made for a challenge at Digital Scrappin. 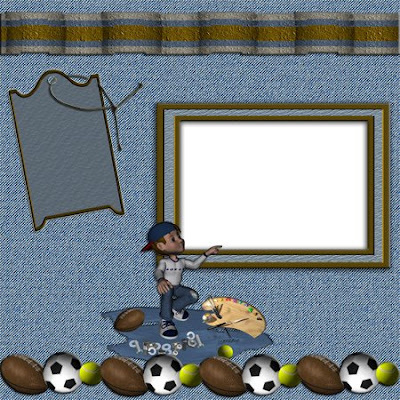 http://digitalscrappin.com/. 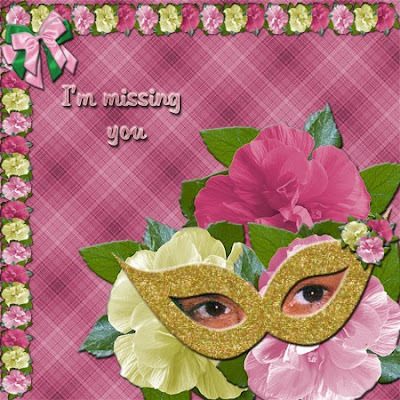 The mask template was donated by kdesigns for this challenge. Tonight's a working night. I want to spent some quality time with Tootsie before I have to get ready to go. 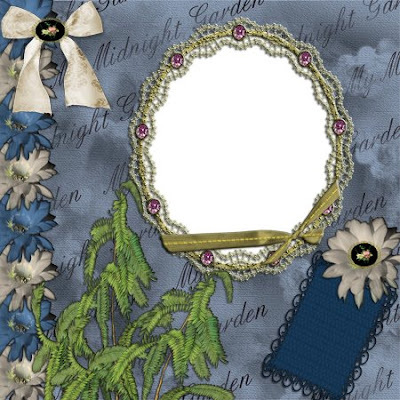 Your freebie today is a layout made with Snow Raven's new kit "Midnight Garden Part 2." You can buy the kit at the store at Scraphead. 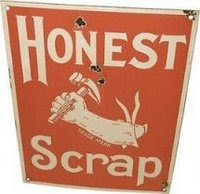 http://www.scraphead.com/ Till tomorrow, enjoy. Wow, what a wonderful surprise for me and quite an honor. 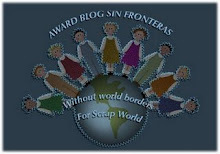 My friend, Kyra, http://smiekeltje.blogspot.com/ has presented me with my very first award in the scrapping world. Thank you, Kyra. Now, I have to pick out seven new people to present this award to, so I need to give this some thought. Tomorrow, I will have my list of names and blog addresses ready. Remember that old song with the lyrics "I feel pretty, I feel special." That's me tonight. What a a week. 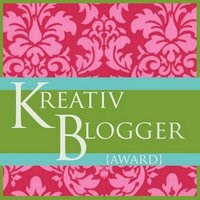 New windows, new bulkhead, possible new outlook for Tootsie, and now an award for my blog. I'm feeling very nice tonight. Would you like to see my new windows? They have made such a big difference in my tiny little living room. Even my plants like it. Now they can get lots of real sunshine and fresh air. Enjoy the layout. 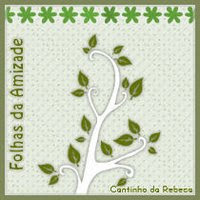 Tomorrow I'll have another freebie, and soon another kit will be here. I have some great pictures to share with you today. 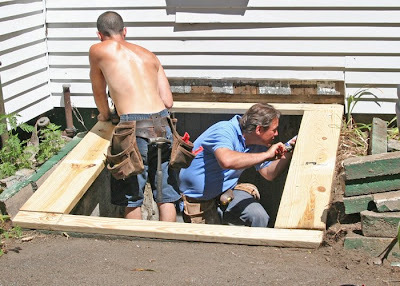 The work crew was here building my new bulkhead. Of course, Moo and I had to go out and chit chat and watch how they were doing. 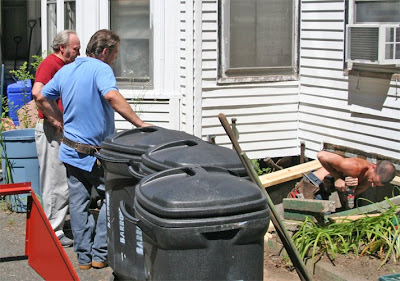 The contractor is a great guy and he and his men do a wonderful job. He and Moo got along famously. I have a couple more pictures, which I'll show at the end of this post. Tomorrow, they will finish the job, not a lot left to do. It will be sad when they go, they were so much fun to have around. Yesterday, I learned how to make something new on Photoshop, and got so excited that I started a whole new kit to go with it. Lordy, this scrapping is very addictive. I mean VERY. But that's okay, it keeps me quite busy and happy. Tootsie and I are going to watch some TV now. Enjoy the photos. Today was another wonderful day. The new windows finally came, and are they ever beautiful! 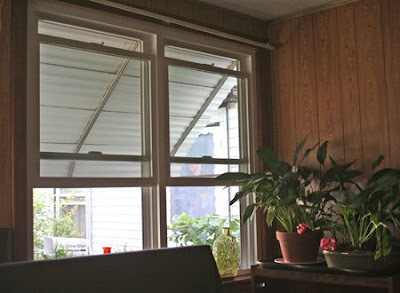 I can see out now, and I can put them up and let in the fresh air. I have missed having the windows so. My old house was windows all over. This one is very lacking in windows. Also, I bought a new AC to cool things down a bit in the house. Poor Uncle Moo has been trying his best to deal with this horrible heat. He's been floating around in a puddle of perspiration. (good old sweat!) Even though it was sweltering today, he put my flags back up on the outside of the house. It felt sort of naked without the flag flying. 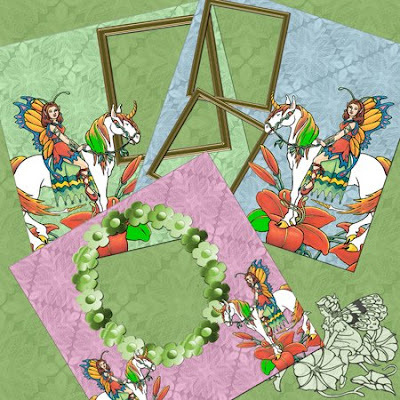 Would you like a QP to go with the "Tiger Lily" kit? Here's a quick layout I made, and I'll post the QP as a freebie for you. That's all for today because Daughter-in-law is coming to dinner. I don't know why I call her that. I do have another wonderful daughter-in-law. And they both have beautiful names. Oh well, we all have our little quirks. This is just one of mine. Enjoy your QP. Well didn't we get a nice surprise today! At Tootsie's morning chemo appointment today, they did some more blood work on her. At this afternoon's chemo appointment, we were told that her results were back, and that she is in a great remission. Hopefully, by September, we'll be able to change her chemo treatments to every 5 weeks. This is fantastic because if all goes well, and she stays in her remission, they will begin to wean her off the chemo therapy. It will take place slowly, but oh thank you, surely. Everything we own will have to stay crossed. We're going to offer one of Tootsie's two-piece suits to Deanne's little one, Sassy. Then maybe they can go to the beach with us. That should make for an interesting day. Tonight, I'm posting the other half of "Tiger Lily" for you. If anyone has any ideas for kits that you might like to have, please e-mail me with your suggestions and I'll see what I can do. My e-mail is listed in my profile. Folks, today will be a short post. I'm not really accomplishing anything creative on the PC because I'm just plain pooped out. I remember when I was younger, I could do several things at once, and go for days on a few hours sleep. I'm not sure when all of that stopped, but somehow age crept in and took it all away. Tomorrow, I'll be back in fine shape. Oh, guess what! Today at the hospital, Tootsie weighed in several ounces lighter than last month. We all cheered. It's so hard for her to lose the weight that the meds and everything else has packed on. So, yeah - Tootsie!! 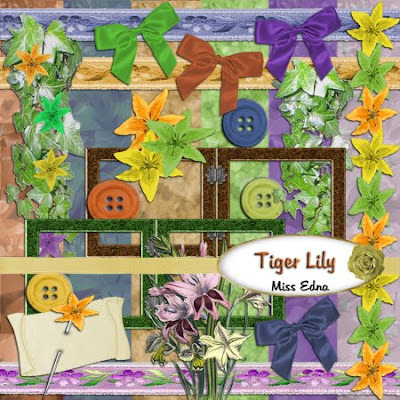 Tonight I'll show you the preview of the new kit "Tiger Lily," and post Part One for you. It's a small kit, but it's bright and cheery. Hope you like it. How about a recipe for a change? 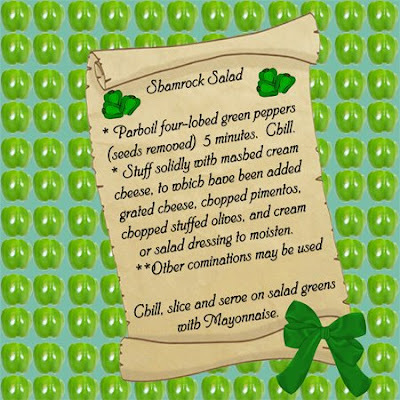 I had to do a salad recipe layout for a challenge at Scraphead, so I thought maybe you-all might like it too. I found this recipe in a very old cookbook, author unknown. It sounds pretty good, if you like peppers, which I do. (Also, now that it is posted here, I've noticed a spelling error on it. I'm sorry for that and will be more careful in the future. The word in question is: "combinations" - I left out the "b," probably from typing too fast. I know, I know, shame on me. 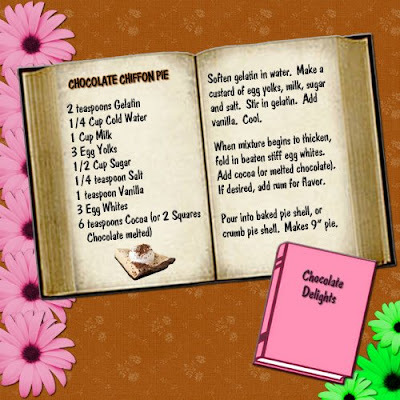 I think I like doing the recipes for the blog. Will look for more interesting sounding ones. Aside from this, I've been trying to get caught up on some of the challenges and working on new kits for you. 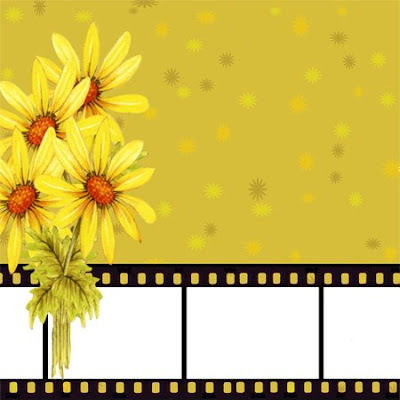 The next layout was done for the "By The Numbers" challenge. The number "seven" had to be represented in the layout. Mine has seven irises in each of the iris borders. Otherwise, the layout is very simple. I like plain and simple. If you like the layout, I'm posting the matching QP as a freebie for you today. 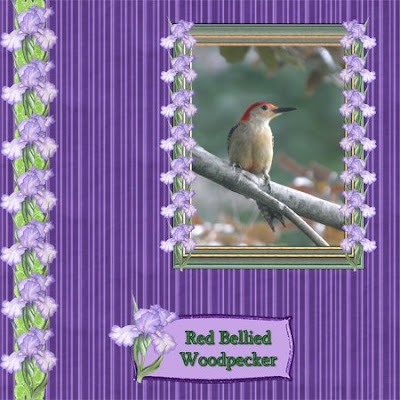 This one was great for scrapping the woodpecker. My other layout was done for the "All One Color" challenge. 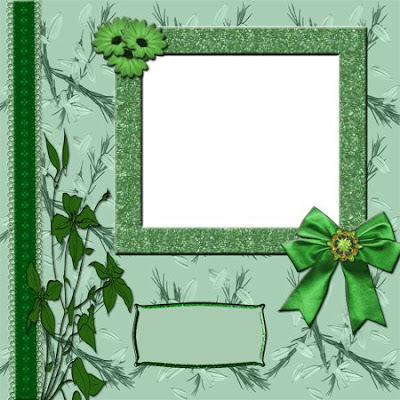 This month the color is green. 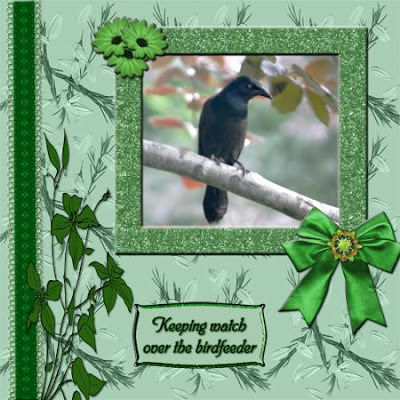 This one features another of my bird photos. I do love my birds. I'll also post the matching QP for this layout as an extra freebie for you. Hope you like them. That's it for today, tonight's a worknight. Got to spend some quality time with Tootsie. Tomorrow starts a new round of chemo for her. Hope you all had a great holiday. BarBQues, friends, parades, fireworks, WOW! I missed all of it. I worked so my friend could stay home and enjoy her family. Tonight, she's working for me. That's what friends do. 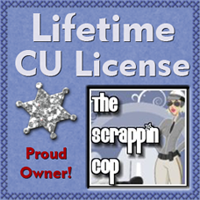 I'm well rested and back at my computer working on freebies and layouts. 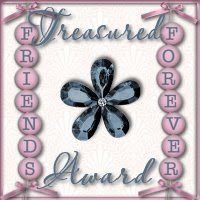 While visiting some of my "internet friend's" blogs these past couple of days, I find that a few of them have either stopped doing freebies or are considering it. Mostly because folks just stop in, grab the freebie, and never take the time to say "thanks" or "hello." So, please when you're scrap surfing, stop a moment to either say "thanks" or "hello, I enjoy your site." These folks work hard to bring you these wonderful gifts, not to mention the chit chat and humor. I would hate to see them disappear. 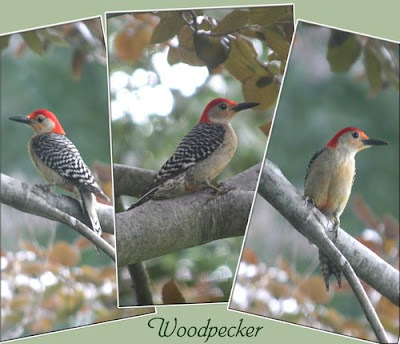 I have been trying for a very long time to get a decent photo of a certain little woodpecker. He is very quick, and doesn't usually stop long enough for a photo shoot. (humor) Yesterday, I got lucky. What do you think? Isn't he a little beauty? 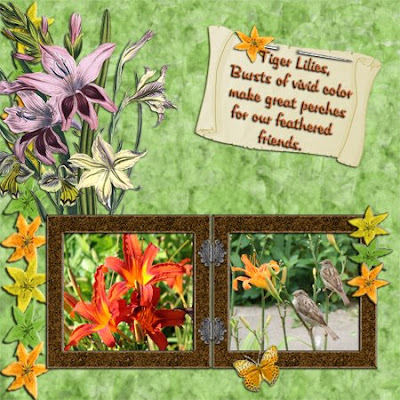 This week's freebie kit will be "Tiger Lily." It's a 2-parter, and I'll start posting it probably Monday. Uncle Moo has a birthday coming up the following week, so I'm saving the "Painter Moo" kit for that week.